Each year Oregon Humanities hosts dozens of community conversations across the state of Oregon through the Conversation Project. Essential to these dialogues and similar programming are the facilitators who plan and drive discussions around big questions and vital issues at gatherings statewide. In recent years, Oregon Humanities has worked to train more people to get more communities talking in Oregon and beyond. 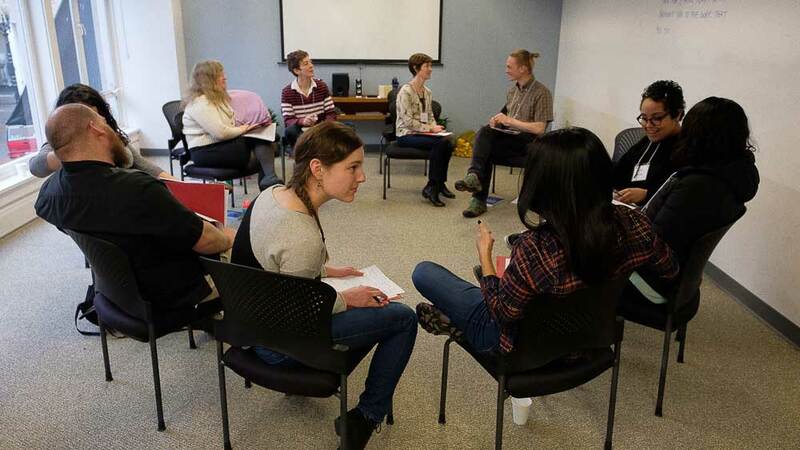 The Facilitation Training program began in 2016 as an open-call workshop in Portland that anyone interested in learning techniques for conversation facilitation could join. Since then, the program has grown rapidly. Prospective facilitators from places as far away as Guam, Florida, Alaska, and Hawaii have traveled to Oregon to participate in facilitation trainings, prompting Oregon Humanities’ partnerships and training manager, Rachel Bernstein, to take the workshops on the road and offer them to humanities councils and related organizations in other states. Oregon Humanities’ executive director, Adam Davis, and a handful of other experienced facilitation trainers have led trainings in New York, New Jersey, Maine, and Michigan, among other states. Recent training sessions have focused on themes: for instance, one in New York was oriented around the works of African American authors James Baldwin and Audre Lorde; another, in Michigan, around the timely topic of water and water rights. Here in Oregon, open-call Facilitation Training sessions will take place in Medford on May 11 and in Bend on October 4 and 5. More information on the Facilitation Training program can be here.